March 1, 2018, Baton Rouge, LA – Newly released documents reveal that Louisiana state intelligence officers surveilled community groups opposed to the Bayou Bridge Pipeline and that regulators used language written by Energy Transfer Partners representatives in documents related to the pipeline permitting process. 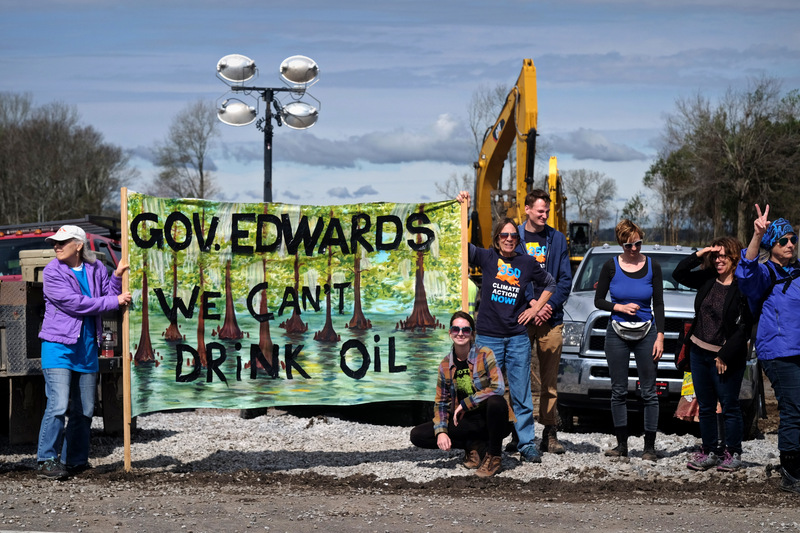 Louisiana Bucket Brigade and the Center for Constitutional Rights obtained the documents through a public records request to the Louisiana Department of Environmental Quality. The documents reveal a high level of access to and coordination between Energy Transfer Partners and government employees, in contrast to the lack of access to regulators and public officials by pipeline opponents. Louisiana Bucket Brigade held a press conference outside the governor’s office this morning where they unveiled the documents. The release of the documents follows a ruling last week by a federal judge in Louisiana ordering a halt to construction of the pipeline in the Atchafalaya Basin “to prevent further irreparable harm,” as well as the revelation in early February that Louisiana Governor John Bel Edwards met with ETP employee Mary Landrieu—a former U.S. senator—to discuss the pipeline, and that the meeting was not reflected on his official calendar. The files show that the Louisiana Governor’s Office of Homeland Security & Emergency Preparedness (GOHSEP) prepared intelligence reports on groups opposing the pipeline to share across agencies. The GOHSEP director sent a report about the Louisiana Bucket Brigade to a slew of state regulatory and law enforcement agencies, including the Department of Environmental Quality (DEQ), the Department of Natural Resources, the Louisiana State Police, and the Louisiana National Guard. GOHSEP also prepared a report about the L’Eau Est La Vie Camp, a camp of water protectors helmed by indigenous and environmental justice leaders on the Bayou Bridge Pipeline route, noting that it is “more formally organized” than resistance to the Dakota Access Pipeline. The emails reveal Louisiana officials are aligned with a growing national trend of surveillance intended to intimidate those who exercise their First Amendment rights. Since the Standing Rock camp opposing the Dakota Access Pipeline in North Dakota was disbanded last year, 56 bills that heighten the risk and criminal penalties of dissent have been introduced across 30 states. Many of these bills seek to frame protests as “riots” and activists as “terrorists” or “jihadists,” in attempts to criminalize protected free speech activity. Notably, there were no emails produced showing serious discussion or concern at the agency about the extensive record of spills, leaks, and explosions of the companies behind the Bayou Bridge project. For more information, visit Louisiana Bucket Brigade and CCR’s case page. The Louisiana Bucket Brigade is an environmental health and justice organization using grassroots action to create an informed, healthy society that hastens the transition from fossil fuels.